The use of graphic images by Arab television news during the war on Iraq, and current occupation, has generated anti-American sentiment in the Middle East, according to US officials. However, in a number of interviews Arab television news editors argue otherwise in this debate, which has become a ping-pong match of accusation and denial between the media and the Bush administration. In his 2004 State of the Union address, US President George W. Bush singled out Arab TV stations as showing "hateful propaganda," and providing unreliable news and information. US Brigadier General Mark Kimmitt, talking to reporters in Baghdad in April, had a novel approach to this apparent problem of anti-Americanism in Arab news. "My solution is to change the channel to a legitimate, authoritative, honest news station. The stations that are showing Americans intentionally killing women and children are not legitimate news sources," he said. Hassan Fadlallah, news editor for the Lebanese based, Hizbullah backed channel Al-Manar, responded to this argument by saying that "the media does not make the images, it transports it." It is therefore not the media that is creating the problem, but "American foreign policy that is leading to an increase in anti-American sentiment in the region," he says. Regardless of whether it is Arab media showing dismembered corpses of Iraqi children, or political, economic and cultural factors that generate anti-American sentiment, the image of America in the Middle East today is as low as it has probably ever been. As a Pew Research Center poll in June 2003 reported, only one percent of people surveyed in Jordan or the Palestinian Authority expressed a favorable view of the US. Favorability ratings elsewhere in the Middle East, carried out by the 2002 Gallup Poll of the Islamic World, were almost all below 30 percent. A survey carried out by American newspaper USA Today in 2002, revealed that feelings were reciprocal: only 24 percent of Americans expressed favorable views of Muslim countries overall, and 58 percent said the number of immigrants from these countries allowed into the US should be reduced. The impression of one another, by Americans and Arabs, is polarized according to these surveys. The media is considered the defining medium to counter these trends, highlighted by the US government's $62 million set up of the Arab language satellite channel Al-Hurra earlier this year. There is no Arab TV network alternative broadcasting in English in America. However, there are reports that the Qatar-based satellite channel Al-Jazeera is intending to start an English language channel, following the success of the Al-Jazeera.net English website. Many of the news editors believed that America's foreign policy activities are responsible for anti-Americanism in the region. Assistant editor in chief at the Lebanese Broadcasting Company (LBC), Elie Harb, says: "The Americans have to understand that you don't need to show pictures to activate the feelings of anti-Americanism. From the beginning of the 20th century, since World War One and the creation of the Israeli state, there has been a lot of hatred vis-à-vis the Western states, especially the British and Americans, because their policy is not balanced in this region." There is truth in this, but Harb also said that the media's usage of graphic images has increased hatred against Americans. On the other hand, the issue of showing strong images, whether intentionally "anti-American" or not, is also to do with competition between stations, he says. "The competition is pushing us to show strong images and use strong language to have more viewers than other TV stations. We don't have this big issue at LBC, but the competition between Al-Jazeera and Al-Arabiyya is very high on this issue." "I remember during the Afghan war we received an image of a dead child with its head blown off, but we didn't put it on the screen. But now, if we had those kinds of pictures, news channels would use them to attract more viewers. There is sensationalism. I am sure all TV stations are increasing the problem, by showing the reality," he added. Fadlallah of Al-Manar, which has a policy of not airing close-ups of extremely graphic images, disagreed that showing reality is anti-American. 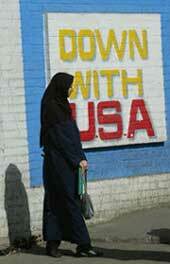 "This is not anti-Americanism, it reflects reality and American policy either in Palestine or in Iraq," he said. "If the media had shown the whole story it would make a bigger impact on Americans. That is why (American news stations) are not showing them," he added. Jihad Ballout, spokesperson for Al-Jazeera, was very vocal on an issue the channel has been repeatedly accused of by US officials. "I think allegations by the US and others (of inciting anti-Americanism), we dismiss them outright, and they are not pertinent," he says. Talking of the channel's editorial policy, Ballout says truth is a given. "We are not going to put footage on air for the sake of it; it has to be relevant. Al-Jazeera is bipartisan so we don't play politics, and cover news as objectively as possible. We reflect what happens on the ground from the Arab perspective as much as say, CNN reflects the American perspective. We are certainly not for or against anybody," he says. Discussing anti-Americanism and the freedom of the media, CNN news director Chris Cramer told the Daily Star, "it is no secret last year that most broadcasters were aware of the hot breath (of the government) on their neck about a number of things. There hasn't been a conflict or war around the world in the last 30 years that I've been working in this profession where there wasn't a hot breath on the back of your neck," he said. "We are cognizant of the fact that this is a domestic US war, an unpopular war (internationally) that is being prosecuted not exclusively, but primarily by the US ... The business of journalism is bound to be controversial," he added.